I’ve often wondered what happens to show bikes once they’re wheeled off the stage and their moment of fame is over. 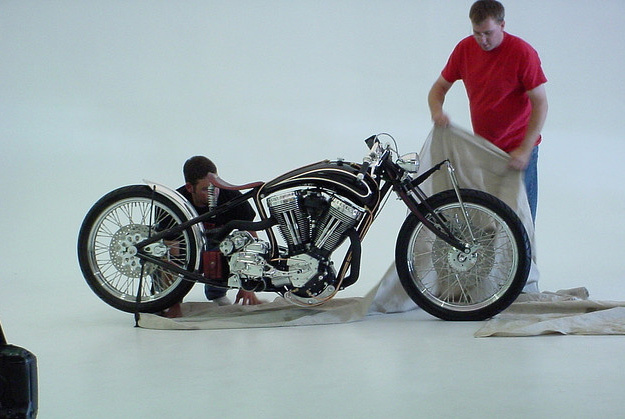 So I was intrigued when Rick Krost of US Choppers put me in touch with the current owner of his Boardtrack bike. This machine took 10th place at the 2005 World Championship of Bike Building, and it now sits in the garage of Robert M. Malachowski, Jr. 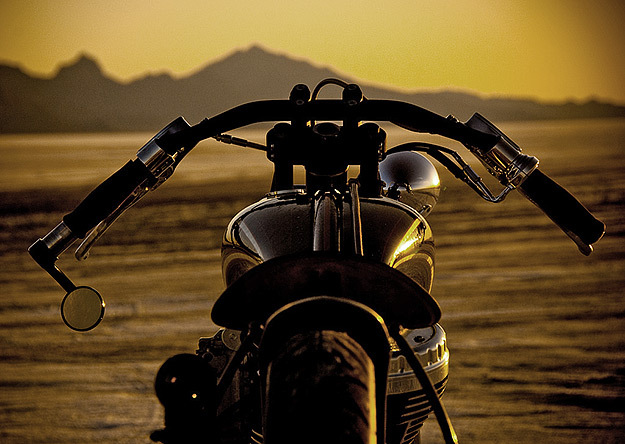 The Boardtrack caught the eye of Malachowski after he saw it in shows, magazines and Art of the Chopper book, and he eventually managed to buy it at an auction in Los Angeles. 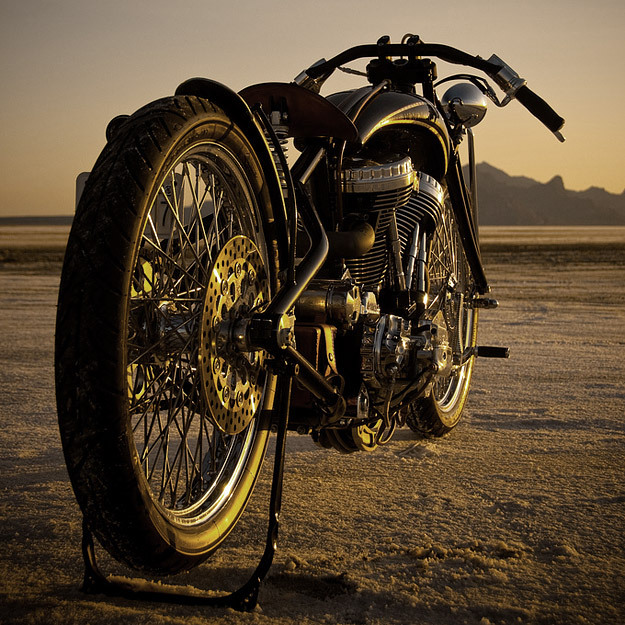 “Rick built the bike by hand using a 100ci Indian Powerplus engine that literally ‘escaped’ the factory just as the doors closed (yet again) in September 2003,” says Robert. “The frame is the prototype built for Rick’s production single loop frame, and the front end is a prototype Kiwi Indian set-up.” The primary is by PM, and the bike is fitted with a six-speed gearbox to make the most of those classic 21” boardtrack wheels. 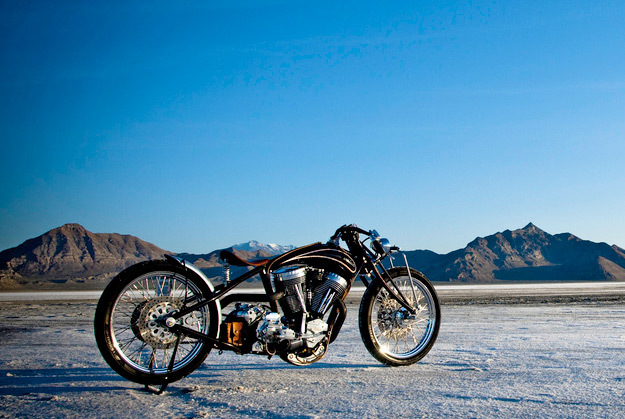 Robert describes the bike as “fast, extremely agile and a blast to ride.” He also has the pictures from Bonneville to prove it, snapped while doing some “quick runs before the police showed up.” Good to see that such an elegant machine is being put to the use it was built for, unlike some show bikes.